The European Starling, Common Starling or just Starling, (Sturnus vulgaris), is a passerine bird in the family Sturnidae. This species of starling is native to most of temperate Europe and western Asia. It is resident in southern and western Europe and southwestern Asia. It has also been introduced to Australia, New Zealand, North America, and South Africa. 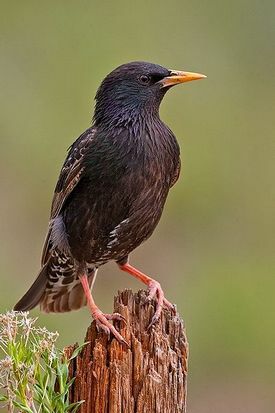 European Starling are among the most familiar of birds in temperate regions. The Common Starling is a noisy bird. It utters a wide variety of both melodic and mechanical-sounding sounds. One of these includes a distinctive “wolf-whistle”. Starlings are mimics. In captivity, Starlings will learn to imitate all types of sounds and speech earning them the nickname “poor-man’s Myna”.